As We know according to Mayan and other beliefs the world will end ..yesterday? Oh well, It is never too late to prepare ourself for Doomsday. As technologist our survival skills perhaps are not as well honed per say. However, we have technology as our weapon. In any way, We feel much safer with our smartphones. Yes! Our smartphones are symbols of our strength, our talismans and our magic wands, links to our allies and our war chests. Without them We are defenseless and vulnerable. But our talismans need energy source and We have to make sure they have enough juice for unpredictable moments. Fear not, BoostTurbine 2000 is a back-up battery with a hand turbine power generator. 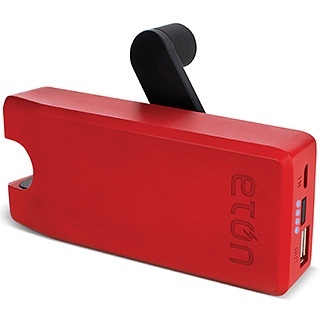 It lets you charge your mobile device when you are really in a bind. One minute of cranking can produce enough power to make a life-or-death call, send a few critical texts, or act as a beacon for fellow techies in the depths of night. Phone power IS real POWER!